William Harvey was an English medical doctor. He was born in Folkestone, Kent, England on 1 April 1573. He was the first to explain how blood was moved through the body by the heart. He died on 3 June 1657 in Roehampton. A hospital in Ashford, Kent is named after Harvey. He went to The King's School, Canterbury, then Gonville and Caius College, Cambridge. He then went to University of Padua where he graduated in 1602. When Harvey returned to England he married Elizabeth Browne, the daughter of Elizabeth I's royal physician. He became a doctor at St. Bartholomew's Hospital in London from 1609 until 1643. 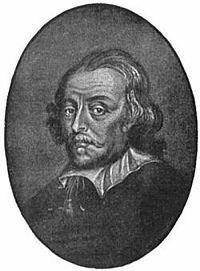 William Harvey is famous for his idea on blood being pumped around the body by the heart. He was the first to describe correctly and in detail the circulation and its properties. A few men knew about the lesser circulation of the blood through the lungs, but their work was lost. One 16th century work on theology, entitled Cristianismi restitutio, was written by Miguel Serveto. After he had been burnt at the stake for heresy (by Calvin), his book was destroyed. Three copies survived. A century and a half later, long after Harvey, someone noticed he had said something about the blood circulating. Harvey announced his discoveries about the circulatory system in 1616 during a series of lectures (his lecture notes still exist). He wrote a book (Exercitatio Anatomica de Motu Cordis et sanguinis in Animalibus) about it in 1628. He said that blood was pumped around the body in a closed system. Blood was pumped by the heart through the body before coming back to the heart to repeat the process. This went against what was believed at the time to be true. The Roman doctor, Galen believed that there were two systems in the body dealing with blood. It was thought at the time that the dark red blood in veins came from the liver and the bright red blood in arteries came from the heart. It was believed that the liver and heart made the blood and it was used up by the body parts it was pumped to. Harvey's ideas came from dissecting human bodies. Harvey found that the liver would have to make 540 pounds of blood every hour for Galen to be right. This showed him that the blood was not being used up. It was being reused by the body. He said blood flowed through the heart in two loops. One loop went to the lungs and got oxygen. The other loop went to the organs and body tissue giving them the oxygen. He said the heart was just a pump that pumped blood around the body. ↑ 1.0 1.1 Singer, Charles & Underwood, E. Ashworth 1962. A short history of medicine. 2nd ed, Oxford University Press, 119/120. This page was last changed on 25 January 2019, at 08:24.